Boy do I have a treat for you!! But first I wanted to tell you that I do read all of your comments and even if I don’t get to reply to them, I do read them. After a few of my coffee drinks, some of you suggested I use Xanthan Gum to prevent my coffee from separating. It works like a charm! A little sprinkle and no more coffee separation. I also asked you what is your favorite kind of coffee is and a few of you said Caramel Frappuccino’s. I was requested to try to make a skinny version of the drink. Hmmm, I wasn’t sure how I was going to do it? I couldn’t find caramel extract in the stores and then one day it hit me, try Amazon! Sure enough there it was. 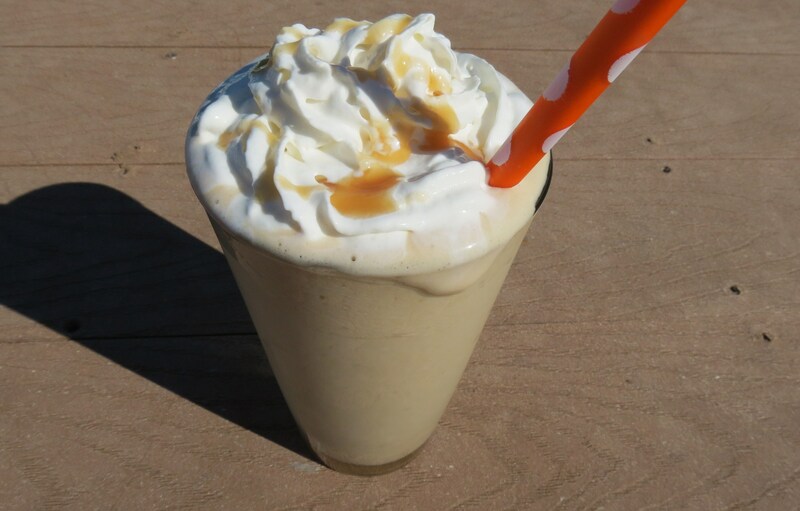 I received my package last week, ran out and got the Xanthan Gum and the Skinny Caramel Frappe was born! This drink tastes amazing!!! 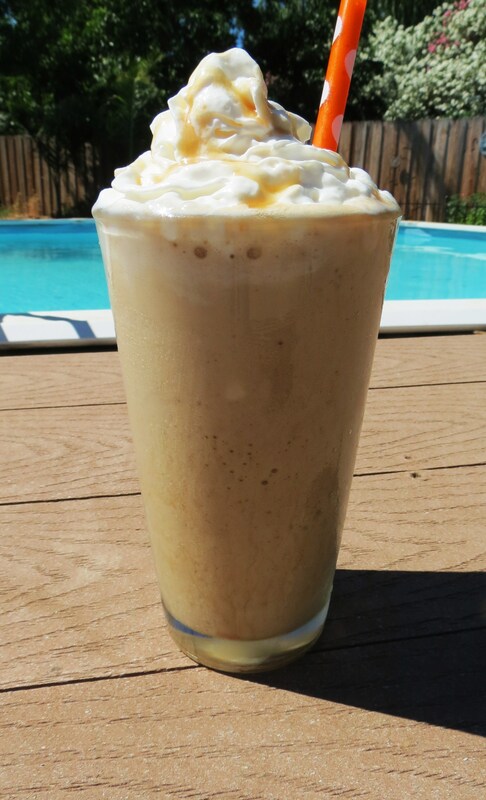 I love that it doesn’t separate and I love that it tastes just like a caramel frappuccino! I know in my recent pictures I put whip cream on top of my drinks and you ask if it is in the calorie count, normally not. But this one it is, and I also included the caramel drizzle on top. How many calories is my 2 1/4 cups of cream goodness? 65 calories!! Love it!!!! This drink is so easy to make. I froze 1 1/2 cups of coffee, and left it on the counter for a few minutes to thaw a little. In a blender I added the coffee, 1/2 cup milk, 1 teaspoon of caramel extract, 1 packet of stevia and 1/4 teaspoon of Xanthan Gum. Topped it with 2 tablespoons of Fat Free Redi Whip, Whip Cream and about 1 teaspoon of Caramel Syrup. Easy peasy! A tasty drink to make and under a few minutes. Beats spending driving to Starbucks! Don’t mind the pictures, it was warm out and the sun really isn’t very kind to my drink! It melts pretty quickly!! You know I like to do my Starbucks Comparison, so lets see how we do. Well, looky, looky!! For mine you get more drink, more than half the sugar, and carbs. Plus mine has a pinch more protein. I’ll take mine thank you very much!! 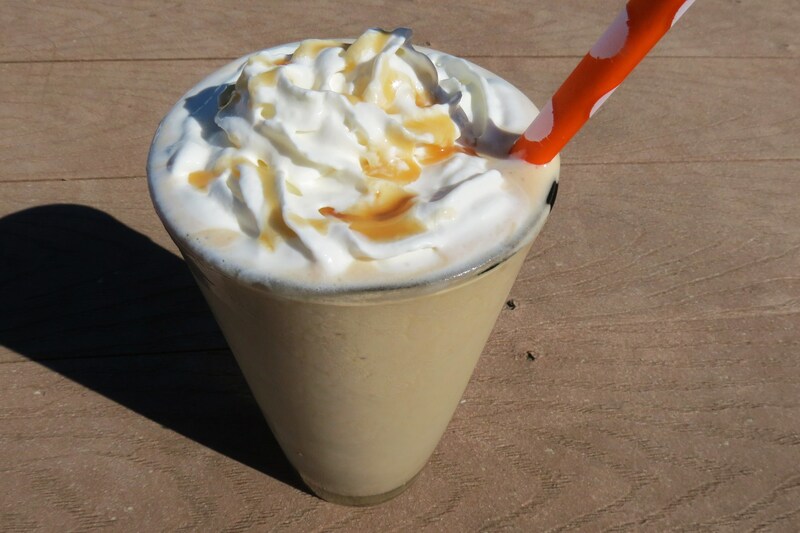 A frozen, creamy coffee drink made with non-fat milk, caramel and topped with whip cream and a drizzle of caramel syrup. In a cup mix coffee and water and stir until combined. Pour into a shallow container, cover and freeze for 4 hours or overnight. 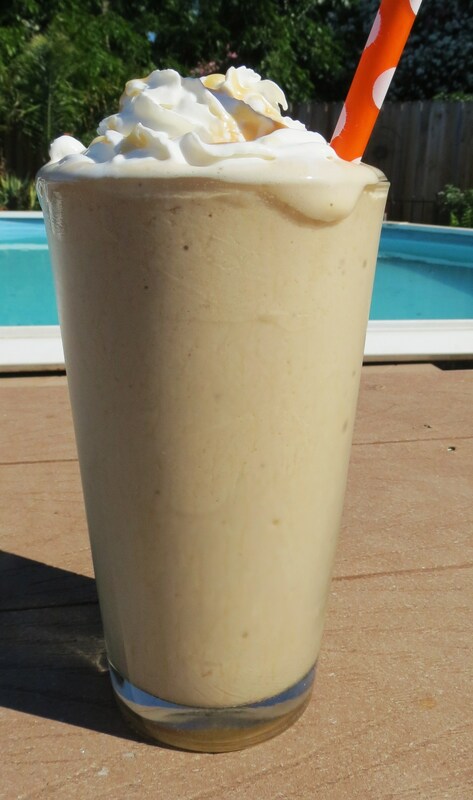 In a blender add coffee, milk, caramel extract, stevia and xanthan gum. Blend until combined. I am having so much fun with these coffee drinks!! What kind should I make next? Do share!!! I find it a challenge trying to come up with a healthy or low calorie version of our favorite drinks!!! It’s my Sunday and I have lots to do today! I have to plan, prep and pack for my trip next week! It’s going to be hard not to cook for over a week. I’m going to miss that but I’m hoping to come up with new ideas while I’m gone. UPDATE: XANTHAN GUM is a gluten free powdered thicker that prevents food from separating. I bought it at my local grocery store in the health food section. I used Bob Mills Brand. This looks exactly what’s needed here inTX, yum! I didn’t xantham would help, but I must try now. Thanks for another great post, and I think you mean “less” than half the sugar and carbs in your Starbucks comparison…..right? Have a great Monday! Yah your right!! 🙂 Thanks for the correction! Caramel fraps were always my favorite but I haven’t had one in at least five years because they’re so high calorie! Love this healthier version. Thanks! I hate the calories of the SB drinks!! There crazy!! This looks amazing — how do you come up with the ideas for all your recipes? I made this one because of you Guys! It was requested, so I took a shot at it and I’m pretty happy of the outcome. Delicious!! I like the idea of xanthan gum to keep it from separating! Going to have to try it! Loving Xanthum Gum! It makes the drinks look so much nicer! I can’t wait to make this. what is xanthan gum and where can I find it? Xanthum Gum is a gluten free powder used to thicken soups, sauces ect… I bought mine at my local grocery store, its located in the health food section. A reader posted that they bought there’s at Walmart. You sure do drinks yummy!! That looks like the best 65 calories anyone could eat/drink!! YUM! Where does one buy xanthum gum? is it powdered? Xanthum Gum is a powder and I bought it at my local grocery store, it’s located in the health food section. I put a link on my blog showing the information on the brand I bought. I love it! Xanthan gum is for thickening right? Where do you get yours? HI Kammie, yes it’s a thickner. It’s a gluten free powder located in the health food section of the grocery store. I put a link on my blog for the one I got. MMMMM that looks delicious. I use xantham gum in all of my smoothies and it makes such a difference. I can’t wait to try your creation! I can’t believe how nice xantham gum is! It’s nice not having my drinks seperate. Your drinks are amazingly good! I’m saving all kinds of money by not going to star bucks anymore! Now how about the salted caramel mocha frappuccino or the mint mocha chip frappuccino? 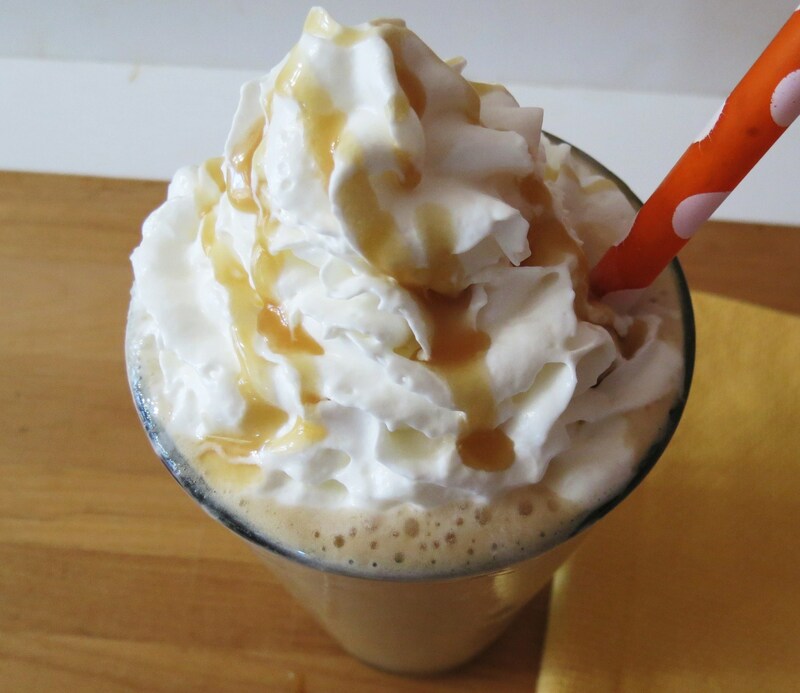 This is my favorite frappe that you’ve shared so far!! 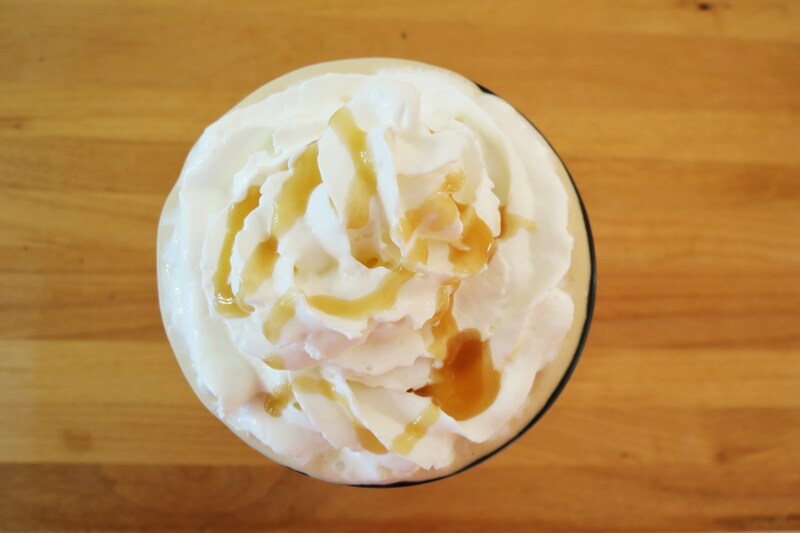 I love all caramel coffee drinks. My ultimate favorite is a skinny iced caramel macchiatto from Starbucks. I hate that the macchiatto is my favorite because it’s really particular to Starbucks, I haven’t found anything that tastes the same but there are some drinks that are similar. This one definitely looks like it will be a close runner!! I made it for breakfast this morning and lucky for me I had the skinny caramel macchiato syrup in my fridge! I used that instead of caramel extract and it was delicious. Seriously amazing! Yum! The caramel macchiato sauce sauce sounds good!! Where did you find it? Loving this coffee!! it’s like drinking a sweet treat! I think you can get it at any grocery store. Unfortunately there’s no Trader Joes by me 🙁 But it’s by all the refrigerated coffee creamers and almond milk. I love it in my coffee protein shakes too! I’ll look fo rit next time i’m at the grocery store, it sounds so good! I knew of the xanthum gum trick, but have never heard of caramel extract. Love this! I’ve been addicted to the coconut cookie crumble mocha from Starbucks lately. My husband laughs every time I order it because it’s such a long name for a drink! I had a hard time finding the caramel extract, thank goodness for Amazon! You can find anything on that site! :)The Cookie Crumble Mocha is my step-daughters favorite. She went to SB the other day to order it and they said they can make it but they were out of the crumble. she was so disappointed, she ended up with a Coconut Frappe. I love it! Going to make one this morning! This looks super delish and refreshing. I need one right about now beings as we have FINALLY gotten our summer weather in CA. Thanks so much for linking up to Creative Thursday last week. I can’t wait to see what you link up next. Have a great week. Thank you for having me! I’ll miss this Thursday’s, but I’ll be back next week!! Your drinks sound AWESOME! Can’t wait to order the caramel extract and buy the Xanthum Gum to make some asap:) One of my sons is a fitness trainer Wait until I give him these recipes! Love this recipe and cannot wait to try! But just want to double check…you do NOT have to brew the coffee? You just mix the ground coffe with water? Yes, that is what I do. Or u could brew some coffee and let it chill in the fridge, then just add ice to the frappe when u blend it together.